Back to the Future written on an XE? 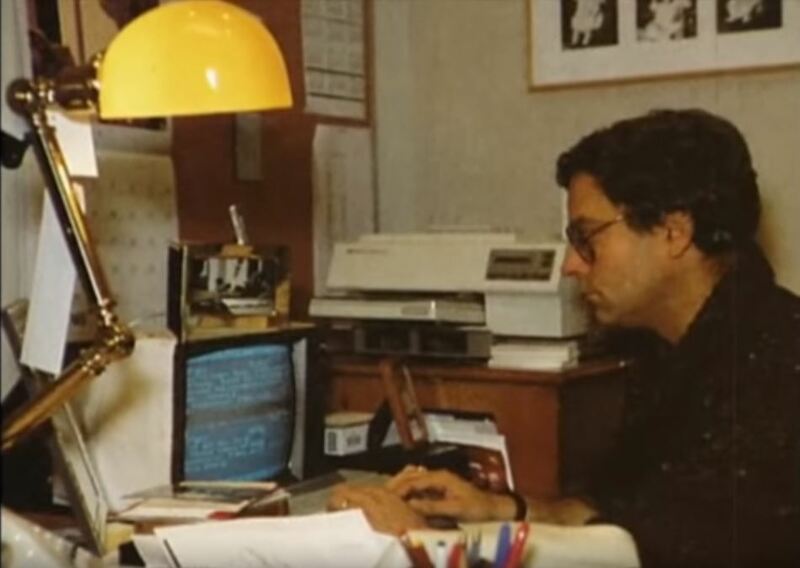 While watching a "Back to the Future" documentary, one of the images shows Bob Gale (co-author) typing the movie screenplay on what I consider to be a clearly recognizable XE. Now, considering that the drafts were written in 1981, and the XE line came right after the movie was released in 1985, the photo may correlate to a later time, and different movie. Still, a good photo! You can see for yourself below, 3:57 into Part 1 of the documentary. Edited by RodCastler, Tue Oct 20, 2015 11:43 AM. One small correction: The XE line came right before the movie was shot, so there is an actual chance that the photo was taken while editing the Back to the Future script. I wonder which WP it is? Also the screen has the Atari blue. Who knew one of my favorite movies may have been written on my favorite computers?!?! Surely he has to be using Paperclip? I wondered the exact same thing, It doesn't seem to be AtariWriter. I like to think it is an early version of The Last Word, which of course would mean that you were at some point, in possession of the DeLorean. That is coincidentally one of the drawcards for working on any project for computer systems of 25 to 30+ years old hardware - that you are doing the back to the future kind of thing in real life - that you are connecting back to some 25+ years ago - like others who are fans of vintage cars or vintage trains/etc. But more importantly with computer games as such - what you are doing with your work, is saying "Hey, this could have been done back in those days" - kind of. But you are doing it the easy way taking advantage of say using a modern day PC and whatever else tools you have at your disposal. I wouldn't want to go back to using A8 software tools or felt pens and graph paper (which I did back then) - which will take far longer with more effort - and so it is somewhat of an unfair comparison. But for purists - if you use more than 16K of memory - you can be considered cheating, even if you are using an unmodified 16K A8 hardware as your target machines - but you can never please everyone - that is for sure. Edited by kiwilove, Tue Oct 20, 2015 4:01 PM. It doesn't take a very powerful PC to run a text editor and cross-assembler, and such things existed in the Eighties too. Regardless of this, the first versions of The Last Word were developed in six months using graph paper, real hardware and a home-written assembler (since I did not own a PC until 2003). Modern tools are convenient but I guess we'd manage without them if we really had to. Or is the suggestion simply that Back to the Future would have been even better had it been written using Microsoft Word 2010? Edited by flashjazzcat, Tue Oct 20, 2015 5:13 PM. I thought it was obvious that he time traveled and brought a computer back from the future. Deffo and XE after blowing the photo up. That is an HP LaserJet II printer in the background, which was released in 1987. Could it be he was working on the second and third movie scripts? The movies debuted in 1989 and 1990. Looks like an Indus GT to the right. What is on the top of the computer though? Is that a shadow? It doesn't quite look like an XE, but the blue screen is pretty definite proof it's an Atari 8-bit computer. I can't find anything on what software was used at the time for screenwriting though. Ok that made me chuckle. Thanks for the laugh. I also guess PaperClip, because it seems to be the only Atari WP where the editor has a line of inverse video at both the top and bottom of the screen. I think the black part through the middle of the screen may be just an artifact of the photo of the TV. I disagree, although I understand your point. I use my a8 for some professional tasks too. I'm a person that get distracted very easily. That is annoying on modern computers who are capable of doing a lot of (disturbing ) things at the same time. I experience a better focus when I'm working in syncalc and doing my business administration or when I'm typing I the last word. I also prefer using native music composers and assemblers because I find that more convenient (and also way more fun) than the modern stuff. I really see the power and ease of modern tools and I enjoy and use the stuff created with that modern pc help. The fact that George R.R. Martin writes the mammoth Game of Thrones novels on a DOS machine is no secret but it is still delightful to hear him explain why. The beloved fantasy author said on Conan that he enjoys the simplicity of WordStar 4.0 and dislikes modern autocorrect and spellcheckers. "If I wanted a capital, I would have typed a capital. I know how to work the shift key," he exclaims to the laughter of a sympathetic audience. There are still a few high profile eccentrics left and certainly the more powerful you are, the more people will work with your eccentricities. Although I have plenty of vintage equipment that I adore, I'd never consider writing a book with them. Besides the restrictions to creating purely text-based stuff (which is really only OK for purely text-based works), there are a lot of efficiencies (and frankly, reliability) you miss out on, i.e., it's actually more effort in the end. Of course there's also others issues, including a lot of publisher templates being based around Microsoft Word (and sometimes screw up if it's not the actual version of Word). In any case I think writing is one of those endeavors that gets easily romanticized, be it using a typewriter, a keyboard that's like a typewriter, a stripped down writing environment, using vintage computers, etc. Ultimately what matters is that you write, of course, but unless you have a very good reason, you should probably do so with the very best tools available at the time. Funny: I wrote a 120,000 word unpublished book using TextPro in the mid Nineties and thought that a PC with MS Word would boost my productivity. However, I wrote virtually no fiction at all since then (it may simply be that the PC's arrival coincided with the start of a dozen years of writer's block). Certainly I feel that MS Word is one of the least appealing creative writing environments, and appreciate the variety of minimalist text editors which have been written to compensate. I still write many DOC files on the A8, where file formats are not a concern. The choice of word processor by itself shouldn't necessarily hinder or boost productivity. It would really only do the latter as part of a modern workflow (meaning it fits in properly as a piece of a modern workflow and does not put up barriers). With that said, as you say, there are tons of minimalist and specialized text editors out there (as one example, I've been using Scrivener of late), so choice of a modern solution as part of a modern workflow shouldn't be an issue. As for Word itself, I've had no issues with it either. It's a fantastic, general purpose word processor. If you have specific needs, however, like writing a screenplay, then by all means there are better, purpose-built tools than Word. Again, I love vintage computers and vintage tech in general, but my nostalgia and rose-tinted glasses don't extend to productivity software. Whether using a C-64, Amiga, Coleco Adam, 386/486/Pentium PC, etc., I've never had anywhere near the reliability, ease-of-use, and no-brainer redundancy that I can get with today's hardware and software. I think the choice of word processor can very easily hinder productivity if - say - the application is difficult to use or otherwise lacking in ergonomics. It may be difficult to envisage newer tools not being better than older tools, but a creative pursuit like writing invites the consideration of all kinds of subtle spatial and environmental influences. One might prefer not to - for instance - write one's novel in a room with livid red walls or while listening to loud Black Metal music. I think when I was first confronted with Microsoft Word for Windows, the screen furniture I had expected to be so productive was - for a while at least - nothing but a distraction. I spent more time formatting text and writing macros: two classic procrastinations you can get into instead of actually thinking of something to write. So I guess this is one reason for the minimalist editors. Depending on the nature of the book, the primary goal is to get words on the page. I'm certainly not suggesting everyone dumps MS Word in favour of AtariWriter, but if there weren't modern alternatives to cluttered, lumbering office suite word processors, I might. Word's great, but it's canonically acknowledged that it's packed full of stuff you don't need most of the time. Of course you can go full screen, hide toolbars, etc, etc, and that's all good. However, MS Word 2013 actually started lagging the last time I tested it on this 3GHz, quad-core Windows 7 machine (it was something to do with hardware accelerated video). I found the fact office software now requires hardware assisted rendering a little ironic, but after reverting to Word 2010 I was happy enough. Sure: I doubt many of us will go back to 8-bit computers, especially if we're producing commissioned work with deadlines. Me: I still like writing technical documentation on the A8. I can't absolutely say why that is, but then again I can't absolutely say why I enjoy writing technical documents at all, or why I enjoy using an Atari 8-bit computer. Somehow I don't look back and wonder aghast how I wrote my dissertation using TextPro and Daisy-Dot II. That is to say, I wouldn't necessary feel the need to write it with MS Word were I able to go back and re-do it today. TextPro got the same words on the page that a modern text editor would, and an 8-bit Atari remained my primary word processing computer until around 2002. I got by just fine (although I had no Internet connection then: everything ended up on paper). As for redundancy: the whole matter may be largely moot anyway, since I notice little functional difference between Word for Windows 1.0 and MS Word 2013 - aside from the fact the newer version appears to demand an inordinate amount of processing power. I think quite a few people never progressed beyond Word 2000 or 2003. Of course there are degrees of credulity, but newer isn't always better. Edited by flashjazzcat, Wed Oct 21, 2015 1:24 PM.